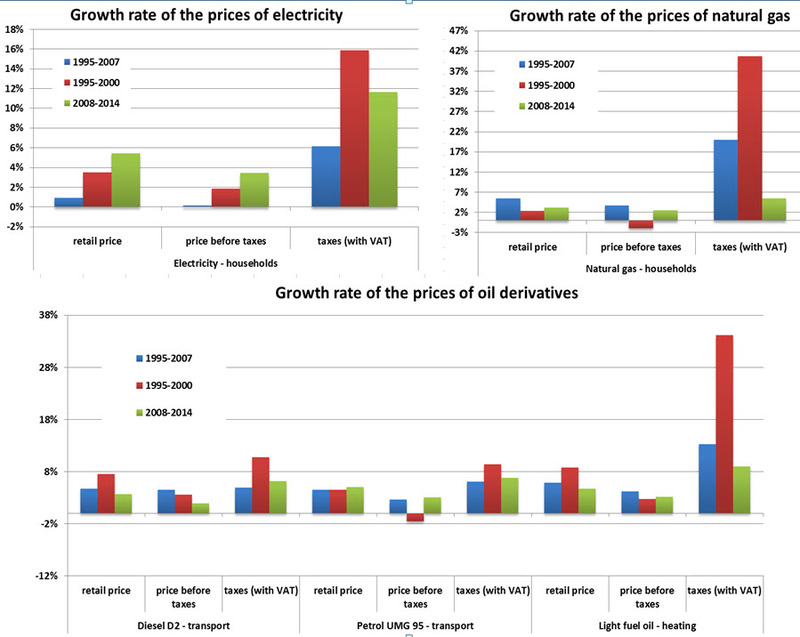 Energy prices increased in the period 2008–2014. In the same period, the highest increase was recorded in the price of electricity (37%) for households, followed by the price of petrol NMB 95 (34%), the price of heating oil (32%), natural gas for industry (25%), diesel fuel D2 (24%), natural gas for households (21%), while the lowest increase (less than 4%) was recorded in the price of electricity for industry. This indicator shows final prices of fuels, including all taxes. Electricity prices are expressed in Euros per kilowatt hour (EUR/KWh), gas prices in Euros per gigajoule (EUR/GJ) and liquid fuels in Euros per litre of fuel (EUR/l). 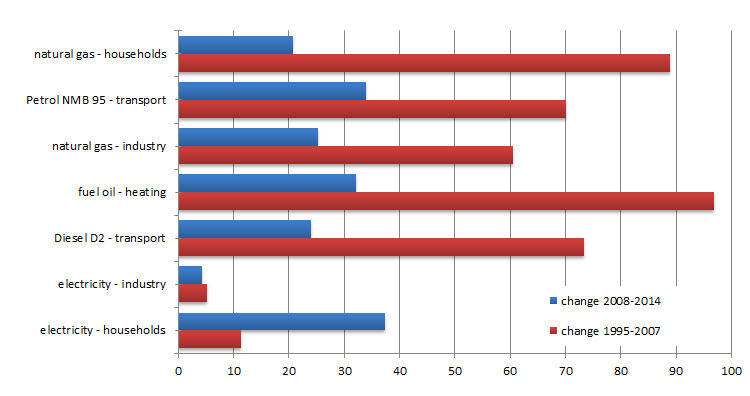 Prices of electricity and natural gas are final prices for typical groups of industrial and household consumers. Prices for industrial consumers do not include VAT. *Comment: The prices for period 2008 - 2014 are calculated with new methodology and are not completely comparable with the prices for previous period. One of the goals of Slovenian energy policy as defined in the Resolution on the National Energy Programme (ReNEP) was to fully open the electricity market, which has been accomplished. A series of other mechanisms to improve competitiveness by indirectly influencing energy prices was foreseen. Energy prices are largely shaped by the market, except for the services of transmission and distribution of electricity, where prices are regulated by an independent regulator. Retail prices of petroleum products are regulated as well, adapting to a reference price on the international fuel market in accordance with a model. National policy has a direct influence on final prices through tax policy. Minimal excise duty rates for energy products are defined at the EU level. The absolute level of energy prices and their fluctuations have both a short and a long term effect on total energy consumption and dictate changes in the demand for different types of fuel. Growth in energy prices stimulates final consumers to reduce their energy consumption, which reduces negative impacts on the environment. 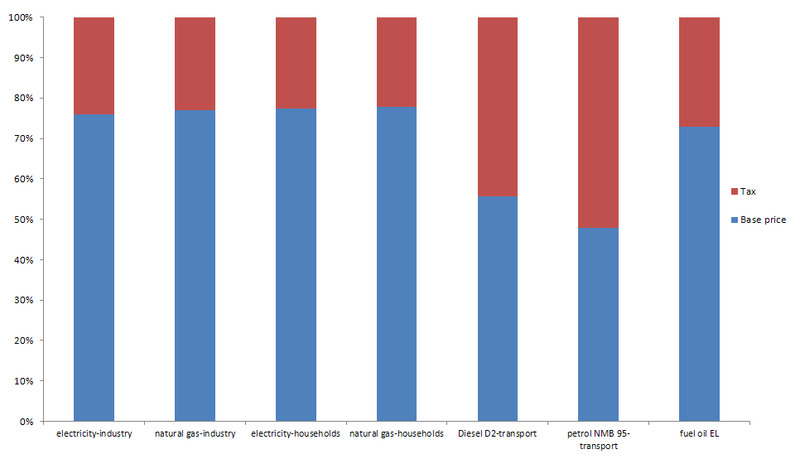 Relative changes in prices of interchangeable energy products influence fuel switching. Opening the markets is intended to ensure competitive energy supply, particularly between industrial consumers, to increase the efficiency of operation of energy companies, improve transparency of energy supply and energy markets and improve energy services that are available to consumers. 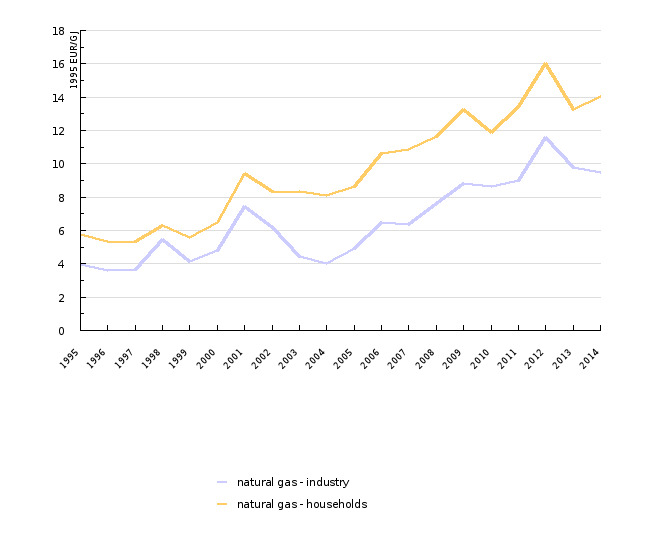 Compared to 1995, the increase in prices of energy products was significant in real terms. The main reason for this was the increase in prices of fuels on international markets. In 2006, only electricity prices remained relatively unchanged compared to 1995. In 2008, they too surpassed the 1995 prices. In the shaping of electricity prices, the most significant impact was felt from the introduction and opening of markets, changes of tax rates and, in recent years, fluctuation of prices on the wider European market. After 1992, electricity prices in Slovenia continued to increase until 1998, primarily with the intention to reach a level that would cover business and external costs of electricity generation and adapt to the gradual introduction of shaping energy prices on the basis of market principles. After the initial introduction and opening of the market in Slovenia, electricity prices in industry dropped and remained stable until 2005. After 2006, they began increasing again in real terms, largely as a consequence of the fluctuation of prices on the wider EU market, where they increased due to higher demand, the impact of the value of emission allowances and high prices of petroleum products on the global market. The 4.3% increase of retail electricity prices for industrial consumers in the period 2008–2014 was largely a consequence of higher excise tax, as the price before taxes was even lower than in 2008. In 2014, retail prices decreased by 1.0% compared to the preceding year, while the price before tax was 0.5% lower than a year earlier. 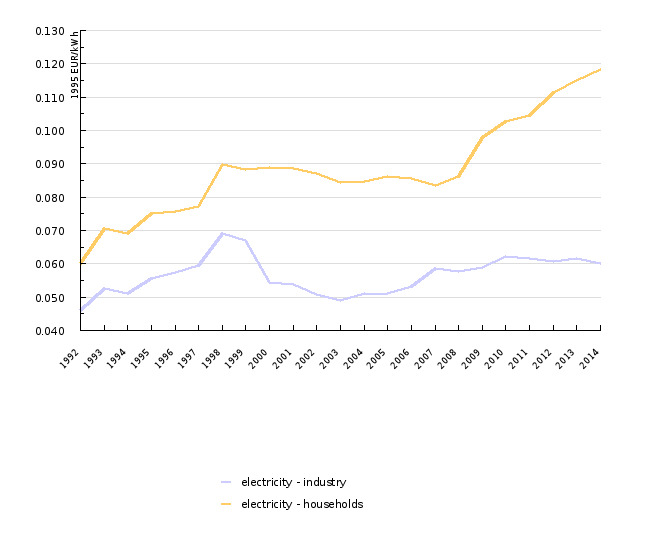 Electricity prices for households increased by almost 20% in the period 1995–2000. The increase can be attributed to a raised tax rate and higher energy prices (see Figure 5). On 1 July 2007, the electricity market opened to household consumers. Although electricity prices for households did not reflect market prices before the opening of the market, no significant price changes occurred in 2008. However, prices increased by almost 37.3% in the period 2008–2014. Compared to the preceding year, electricity prices for households increased by 3% in 2014, primarily due to increased tax fees and contributions. Electricity prices in Slovenia remain below the EU-28 level. 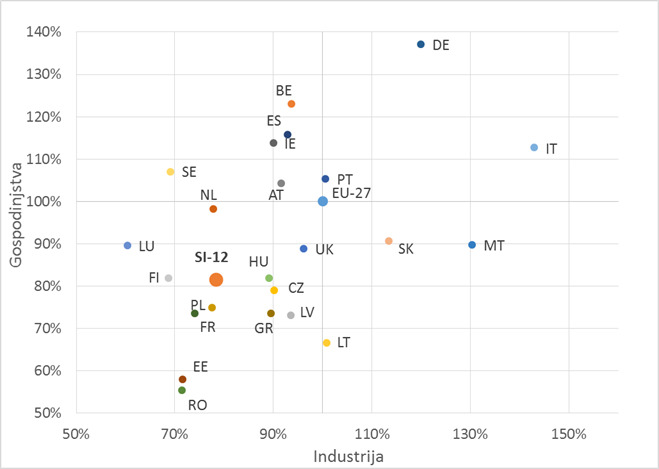 In 2014, they were 20% and 31% below the EU-28 average for households and industry, respectively. While the growth in natural gas prices in Slovenia was moderate until 1999, it intensified significantly in the period 1999–2000. The reasons behind the growth before and after 2000 are varying. In the period 1995–2000, the main reason for the increase in natural gas prices was the increased tax charge (increased share of taxes in the final price of natural gas). After 2000, a notable fluctuation of prices for households as well as industrial consumers can be observed. In the period 2008–2014, the prices of natural gas for industrial consumers increased by almost 25% in real terms, while the prices for households increased by almost 21%. In 2014, the prices of natural gas for household consumers increased by 6% compared to a year earlier, while the prices for industrial consumers decreased by 1.2%. The main reason for the aforementioned increase was a higher base price of natural gas as a consequence of general conditions on international natural gas markets. The base price of natural gas for household consumers in 2014 was almost 5% higher than in 2013. The decrease in the prices of natural gas for industrial consumers, however, was a consequence of lower base prices, which were 3.1% lower than in 2013. 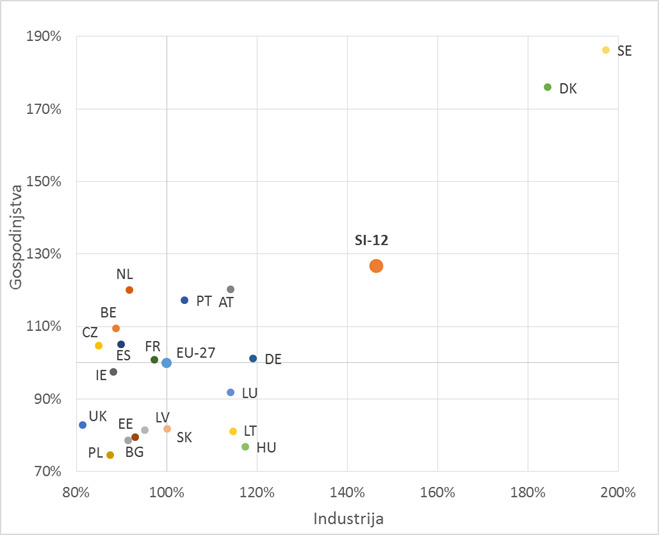 The prices of natural gas for industrial consumers in Slovenia are 20% above the EU-28 level, while the prices for household consumers are 12% below the EU-28 average. Slovenia is one of the few EU countries that fully regulate the prices of petroleum products. It has a prescribed methodology for shaping base prices of fuels, while the state also influences the final prices by defining the excise tax rate. The basic purpose of the introduction of controlled prices of petroleum products was to protect consumers from oligopolistic price setting by fuel traders as well as to enable implementation of protection measures against the impact of world oil prices on inflation in Slovenia. In the period 1995–2007, prices of petroleum products were increasing in real terms, with an average annual growth rate of over 4.5%. However, the main reason for growth before and after 2000 is not the same. 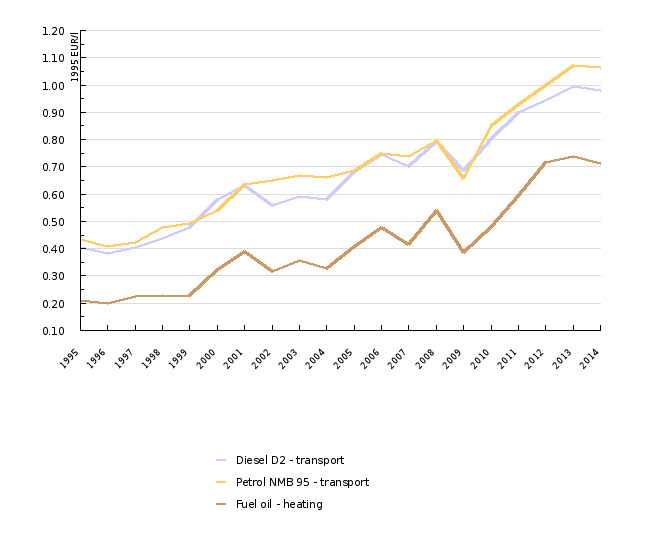 In the first period, increasing prices were primarily a consequence of higher taxes on petroleum products (introduction of excise tax and VAT), while the reason for growth of retail prices of petroleum products in recent years is largely a consequence of increasing base fuel prices due to high prices of oil on global markets. In 2014, a slight drop in prices of petroleum products was noted compared to a year earlier. The price of D2 diesel fuel decreased by 1.4%, the price of NMB 95 gasoline fuel decreased by 0.5%, while the price of fuel oil was 3.1% lower. In 2014, the share of taxes in the price of D2 diesel fuel amounted to 50.5%, the share in the price of NMB 95 gasoline fuel was almost 60%, while the share in the retail price of fuel oil was 30.6%. 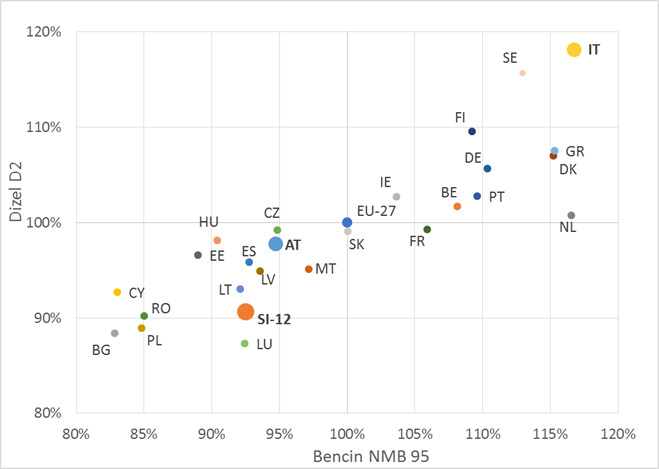 In 2014, retail prices of NMB 95 unleaded gasoline were 10% above the EU-28 average, while prices of D2 diesel were 14% below the EU-28 average.